Just past the midway point in the season, and I’m still not quite sure what we have with this year’s Union team. The defense has been a pleasant surprise and the midfield trio has solidified, but we still sit in 8th place in the East, within striking distance of that glorious 6th place and final playoff spot. Otherwise, we’re pretty much exactly where most of us thought we would be now. That’s a problem – one that quite frankly, shouldn’t wait until the off season. I understand and appreciate the plan in place to build through the academy pipeline, supplementing with some established veterans at key spots, but we’re now a team that, nine seasons in, has one clear cut playoff caliber team (2011) to its name (plus a 2016 team that slipped in the backdoor with a losing record). Why not make a push this year? Mediocrity shouldn’t be acceptable, particularly with some good pieces in place. 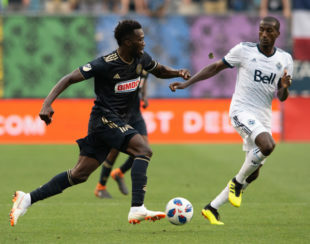 A veteran midfield seems to have figured out how to play together and create chances, with Borek Dockal now looking like one of the most talented Union signings to date. In my opinion, Ilsinho has looked especially active and dangerous lately as well, combining with Rosenberry to create offense down the right flank. The team creates chances fairly consistently, but quality in the final third still lacks. Results thus far in 2018 back this up, as our Union are the lowest scoring team in the East, and only a suddenly impotent Seattle attack is scoring less out West. All the more frustrating is nine shutouts in 18 matches – not the stuff that breeds winning streaks or highly entertaining soccer. Our strikers may defend well, take their fair share of hits, and do their fair share of work, but at the end of the day, there’s a combined 4 goals to show for it. Gyasi Zardes is in double digits. Some dude not named Chris Wondolowski has 10 for San Jose. Teal Bunbury, of all people, has 10 goals for a surprisingly decent New England side. It feels like Zlatan just showed up last week (14 games played in reality), and he already has 11 goals. Insert scoring production like that to the top of our offense, and we’re in strong playoff position today. C.J. Sapong was a savvy addition to the team when acquired and had a great run of form last year that led to a USMNT call-up, but it just isn’t working this year. I legitimately like the guy a lot. He seems frustrated though, and there just isn’t a lot of meaningful depth to plug in and give him a much needed break to rejuvenate and recharge. Corey Burke is a nice story and has looked very effective in spurts (admittedly more effective than Sapong of late), but his ceiling appears to be as a high energy back-up striker. It’s time for an upgrade, and given successes of guys like Zardes and Bunbury, it doesn’t have to be some flashy international player. Standing by your current players is a noble thought, but this team deserves more. Fans certainly deserve more. The center midfield trio, goalkeeper, and even the young defense is good enough to compete against playoff calendar competition. Scoring from the wings hasn’t been quite as expected, but production from the striker spot is clearly something that can’t be ignored any longer. Union – please make this summer transfer window an impactful one. Author: Scott Ellis Scott Ellis is a product development guy by day, husband, dad, men's league soccer player, youth soccer and basketball coach, and 9-year season ticket holder. He believes in craft beer, grilling pretty much anything, the beautiful game, sports movie montages, and that Jimmy Chitwood can take anyone one-on-one. Follow him on Twitter at @ScotteDoop_COYB. My five missteps would be 1) Whiffing on Accam – not sure what didn’t work, but that’s a huge, expensive miss. 2) Not addressing the forward position – we were stuck with Simpson, but knowing he was buried in the doghouse, needed a more proven alternative to turn to 3) left back – Gaddis has been good, but we’ve been without a real clear answer here for years 4) possibly agree with the Dockal timing, though he appears to be a good talent and fit now. Without knowing the back story, I’m not sure if there was an opportunity to get him here sooner. 5) I tend to agree on Curtin – I’m not convinced he’s a bad coach, but results are what they are, and it feels like we’re past the point of shaking that up and seeing if a different approach could get more out of the current group. It does not help mid season acquisitions that a more fundamental process than finding a better finisher is finding a new sporting director. Of fundamental important to the next couple of years is whether Dockal and his family like living in Philly. Does anyone have insights? Another excellent point…who’s on point to be the decision maker during the summer window? Albright? Will the Chinese team take MLS funny money? Because Jay Sugarman is not spending any of his own cash on a transfer fee. not to diminish his contribution but i find Dockal and just about anyone on this team expendable under a new, outside-hired SD. if this season wraps with another playoff miss (as i expect), i would cut ties with him if the transfer fee robs us of precious little $$$ for other positions.